Two Fort Valley State University agricultural science majors received national recognition for their research presentations during a conference in Washington D.C. Seniors Xavia Taylor of Moultrie, Georgia, and Demetrius Calloway of Dawson, Georgia, earned second and third place awards, respectively, along with cash awards for their poster presentations at the Emerging Researchers National (ERN) Conference in Science, Technology, Engineering and Mathematics (STEM). The ERN Conference, held annually in the nation’s capital, prepares students for science careers in a global workforce and helps undergraduate and graduate students enhance their science communication skills. More than 800 students attended the conference, including 14 FVSU students. Taylor, a plant science biotechnology major, won second place in biological sciences for her research on microbiology and genetics. In summer 2017 at the University of Georgia (UGA), she investigated the in vitro of Cas1 and Cas2 proteins of the streptococcus thermophilus CRISPR-Cas (clustered regularly interspaced short palindromic repeats) immune system. The 22-year-old aspiring pediatrician said the most enlightening part for her was sharing her findings and receiving feedback from other professors who are also studying CRISPR. “Going to conferences and presenting your research, you get better with your public speaking skills. Any student should embark upon it. It gives you the opportunity to communicate with your peers and others in your career area,” Taylor advised. Excited to present her work, she said this will likely be her last conference before graduating in May. In addition, Calloway took home third place in ecology, environmental and earth sciences. In summer 2017 at the Savannah River Ecology Laboratory in South Carolina, he researched the fate of atmospheric mercury in ephemeral wetlands. The 22-year-old animal science major studied which location of wetlands had a higher mercury concentration and if hydroperiod correlates with the concentration. Pleased with his award, Calloway said his internship at the Savannah River Ecology Laboratory prepared him for his presentation. His goal after graduation is to apply for the Peace Corps and serve in Madagascar, South Africa or Tanzania. Originally interested in becoming a veterinarian, Calloway’s career choice changed to wildlife conservation and ecology. “I was born loving wildlife. I lived on a farm,” Calloway noted. He also commended FVSU’s animal science program for making an impact on his studies. “I would like to see it go further after I leave. I hope the students who come behind me get a better education with animal science. They should take it seriously. You can really do a lot with this program; it’s not just about farming,” Calloway said. Proud of his 14 students, Dr. Sarwan Dhir, professor of biotechnology and director of FVSU’s Center for Biotechnology, said seeing them present their research is always a rewarding experience. “Conducting and presenting research at the undergraduate level is vital to the success of students in graduate or professional school. I will continue to encourage them in their academic careers,” Dhir said. For more information about the ERN Conference, visit https://bit.ly/2pNbgme. 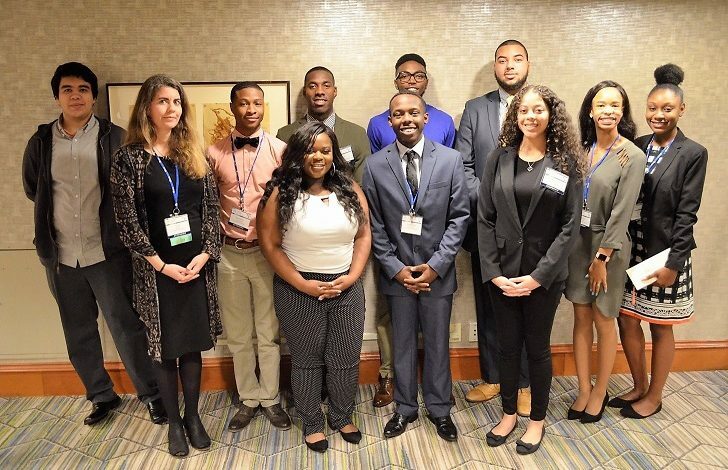 Main image caption: Fort Valley State University students recently traveled to Washington D.C. to exercise their communication skills at the 2018 Emerging Researchers National (ERN) Conference in Science, Technology, Engineering and Mathematics (STEM). Xavia Taylor (far right) and Demetrius Calloway (third from left) won second and third place awards, respectively, for their poster presentations.